When the outdoors call, you and your little patcher will want to be outside enjoying all that nature has to offer. Patching doesn’t need to take a break when we go outside and in fact, there are many ways in which patching and the outdoors can go hand in hand. Here are 10 great ways to patch while playing outside. Playing games like catch is great while patching. Throw the baseball, toss the footy, kick the soccer ball, there is endless fun while a ball is involved and it will work your patcher’s depth perception and hand and eye coordination too. Remember your eye safety though and wear protective eyewear (like polycarbonate sunglasses) while you're playing. And take it easy - remember your child will be playing with one eye! For young children, taking a leisurely stroll is a great opportunity for patching. As you walk around the neighbourhood there is lots for their little eyes to see and try and focus on. 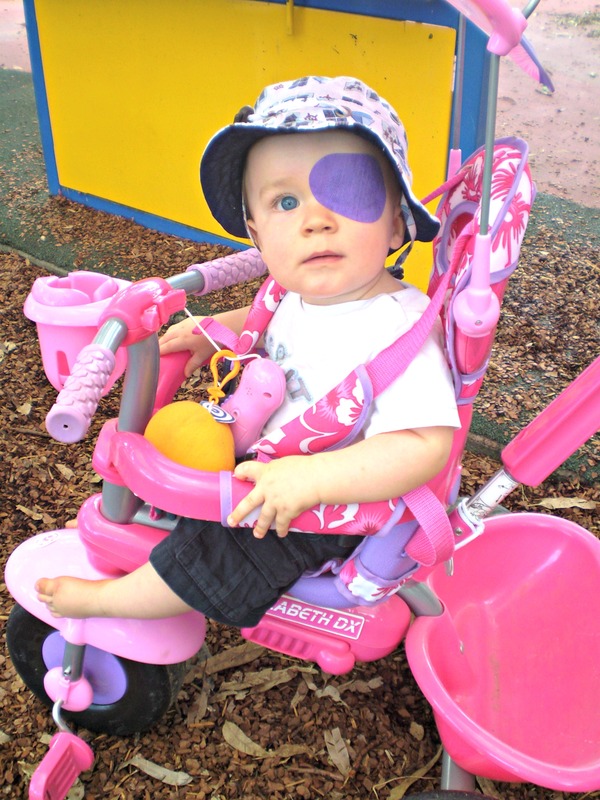 Young babies can be in a stroller or pram (or your big sister's pink bike! ), while older kids can walk with you. It's amazing just how distracted kids can get simply by being outside and having things to look at. When Dane was a baby he would happily patch for hours if we were just cruising the neighbourhood or shops. This game is an oldie but a goodie when patching is involved. You can play this anywhere, and moving outside brings a plethora of new options to ‘eye spy’. Play in your backyard or take this game on a stroll. Oh what fun it is to create a nature hunt. For younger kids, you can play together and see what treasures you can find, (a rock, a bent twig, a brown leaf, etc). Give older children a list of images on a piece of paper and let them run around in nature trying to tick them all off, while the patch stays on. Who doesn’t love bubbles? Right! A big tub of bubble soap and different wands can make keeping your patch on a lot more fun. If you’re worried about the bubbles and eyes, basic swim goggles over a patch are a great trick. Same as bubbles, water play is right up there on the list of things kids love. Use a water play table, or create your own with buckets, cups and sponges. 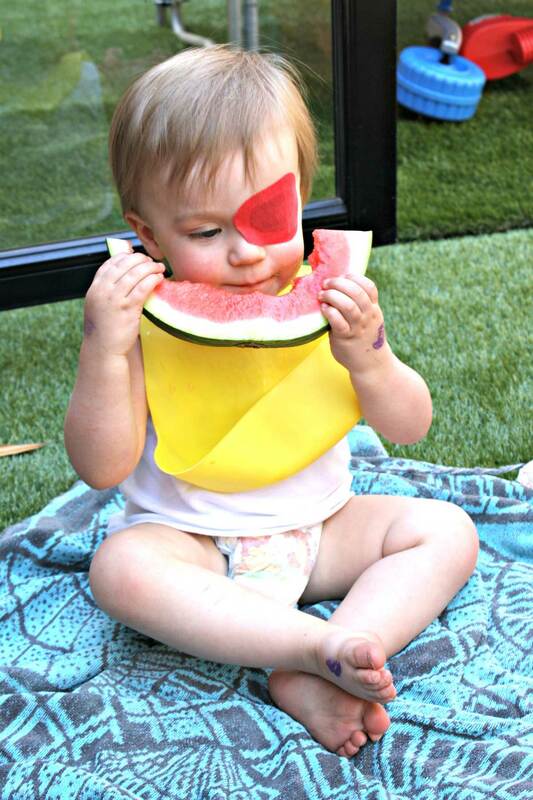 Swim goggles on during water play will help keep your patch dry. Wet patches might need to be replaced, depending on the splash factor from your child. If your child wears a contact lens water play might not be the best option but for those who just patch, it's great fun! Dane 'washing babies' at kindy. We were so lucky that his kindy were fantastic in helping get his patching time in with some great activities. Fun things like a ring toss, drawing with chalk, mini putt, or building a sand castle, are all great for patching time. Keep the patch on the whole time and visit somewhere new and exciting. For young kids, this could be a new park, a library, or the zoo. For older children you could surprise them with a trip to their favourite place, with one rule: patch stays on. Meet some friends and head to the playground. Nothing helps distract little patchers more than running around with their friends. Sometimes just a change of scenery can help. When the patching gets boring and you’ve already gone through heaps – take a breath and change perspective. Have a picnic lunch outside - or a big juicy piece of watermelon (saves on the cleaning up too!). Read a book under a tree. Take an outside bath in the baby pool. When it comes to successful patching, every bit counts. Distraction, stimulation and fun are key. Getting outdoors is great for everyone and it doesn’t have to mean patching stops. So if the sun is shining, grab your sunglasses and hat and head outside! Need some indoor patching ideas? Click here. Need some patching tips? Click here.